I didn’t believe it. But it’s true. 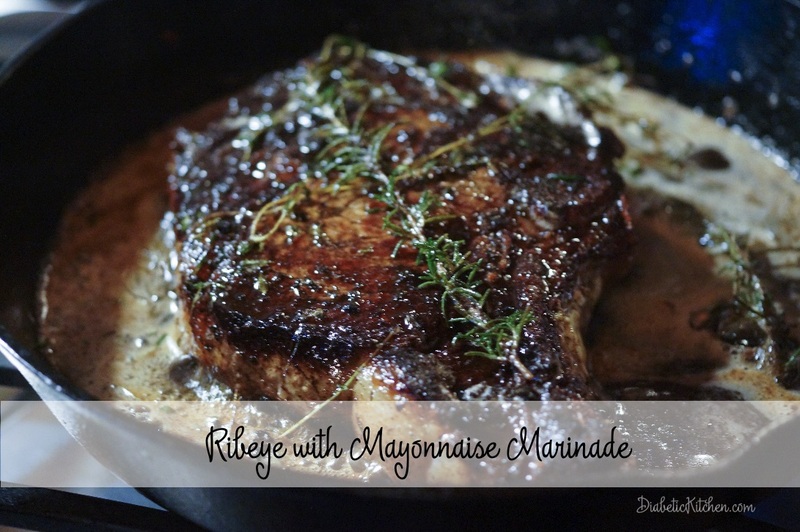 Using mayonnaise as your marinade will produce a crisp and flavorful steak. In your cast iron skillet! 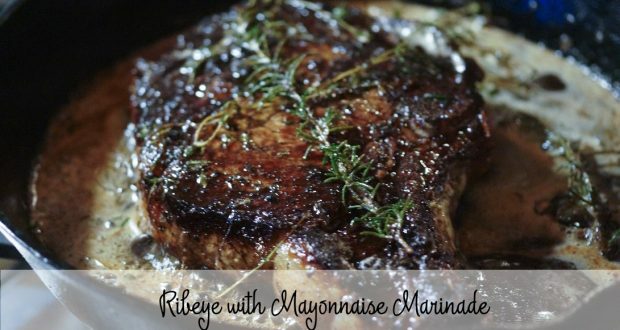 Mayonnaise is fat and it becomes a wet brine which helps the spice stay on the steak instead of ending up floating all over the pan. 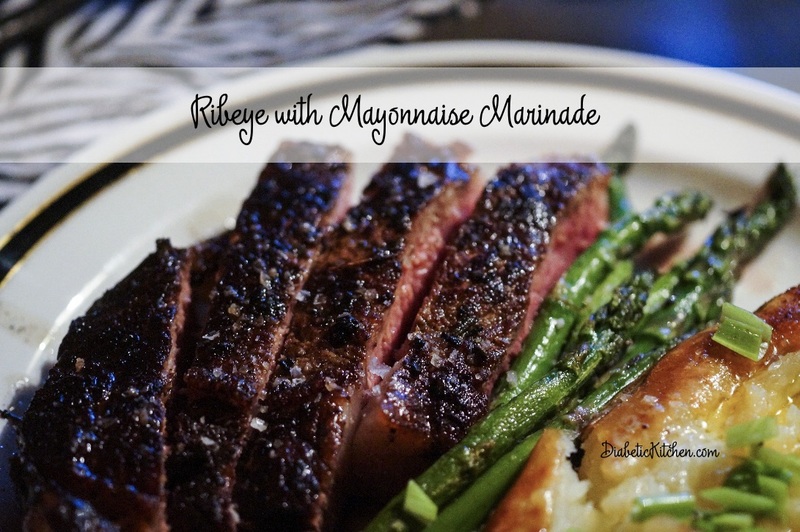 The mayonnaise helps create that thick crust with a char without burning the steak in the skillet. First go to your butcher and have them cut a grass fed bone in rib eye 1 ½ inch thick. For me a thicker steaks means less chance of over cooking for me even though my hubby would eat it well done …. not me. Plus I wanted it to serve two people and keep our protein at around 6-8 ounce per person once the bone was gone and the fat rendered. Now for the marinade. What flavors do you like? I typically have used garlic granules, salt and pepper. Then I will finish the steak with a compound butter that usually has rosemary, lime zest and garlic in it. So I decided to start there. I added fresh garlic, fresh thyme, salt and pepper to the mayonnaise. Taste it. See if you want more of any spice or add your favorite spice. Then smear it on all sides of the rib eye. I let it sit for 30-45 minutes to make sure the steak was at room temperature before I started cooking it. While you are waiting prepare your sides. I have also found the Omaha Steaks has the best guidelines and almost foolproof guide on how long to cook each side of a steak, based on thickness to end up with the serving temperature you desire. I have yet to master the touch test. I heated the cast iron skillet on medium high until very hot. Then I put the steak in the skillet. Then I didn’t touch it for 4 minutes. I just had to peak and wow the side that was cooking was golden brown. Why? Because the mayo and become the fat in the pan and it was glorious. In the past when I have tried to get this in my cast iron skillet, the combo of olive oil and butter definitely did not work as well as the mayonnaise. Once I was ready to turn it over, I took the tongs and held the steak on its side to seared the edges of the steak. Then I flipped it over. Next I added 1 tablespoons of butter, a clove of garlic, the fresh thyme and rosemary sprigs to the mayo butter in the pan. 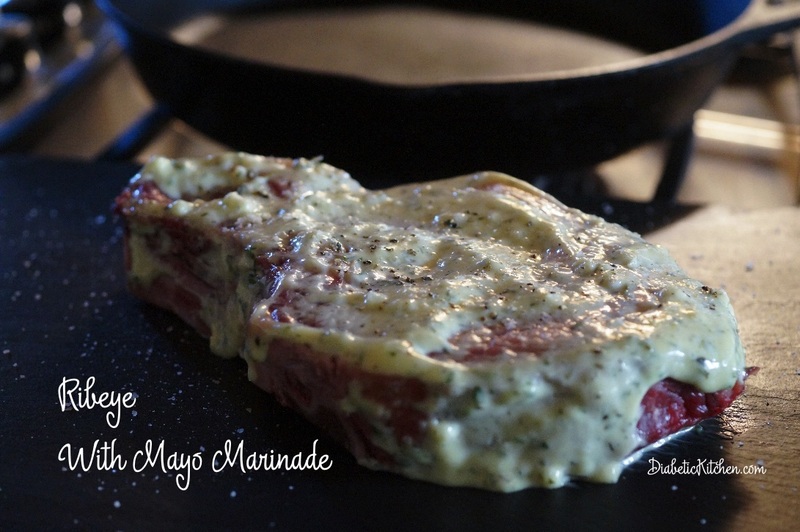 Tip the pan and baste the steak with the mayo herb butter. Do this ever 2 minutes or so. You will cook the this side of the steak for six more minutes or until an instant read thermometer inserted into the center reads 130 degrees. This will yield a medium rare steak. Remove the steak to a cutting board and let it rest for 10 minutes. Cut the bone off the steak and slice it against the grain into slices. Place on your plate with your sides. Finish with Pink Himalayan Sea Salt. Have your butcher cut your rib eye 1½ inch thick. This will give you 3 servings of 6 ounces each. Chop the thyme. You can use the stems. Chop fine. The stems have lots of flavor. Mince the fresh garlic. 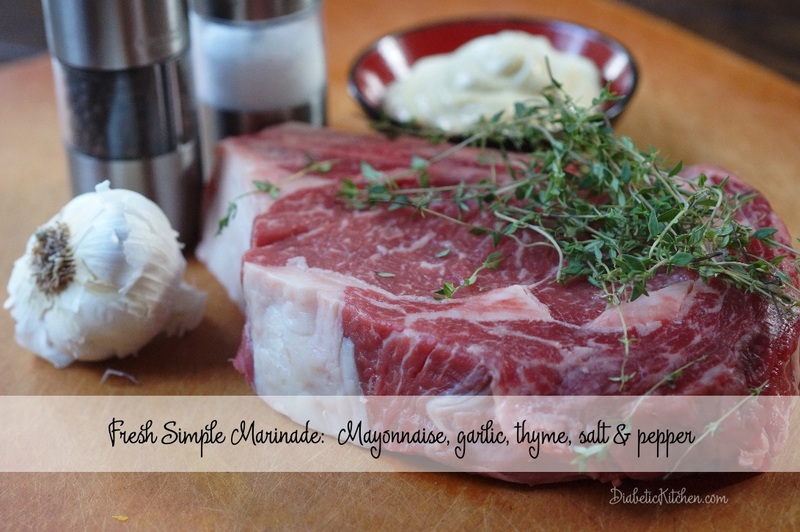 Mix mayonnaise, thyme, garlic, salt and pepper in a small bowl. Spread over all surface areas of the ribeye. Let rest for 30 minutes or until steak is room temp. Heat cast iron skillet on medium high heat. When hot place steak in the pan. Cook for 7 minutes. Then use tongs to lift and sear the sides of the steak. Once all the side are seared turn it over. Place 2 tablespoons of butter, garlic clove and the sprigs of rosemary and thyme in the pan. You will already of lots of liquid from the mayo in the pan. 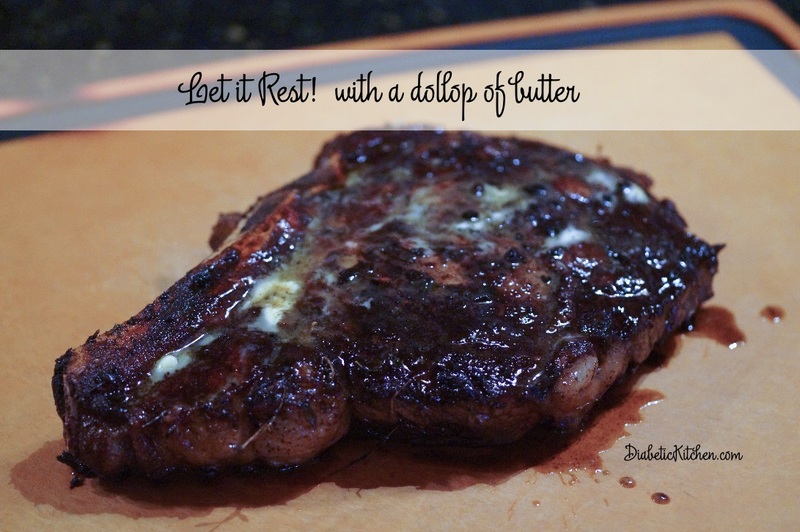 Once the butter has melted, tip the pan and spoon the butter liquid over the top of the steak. Do this ever 2 minutes. Cook the steak for a total of 6 minutes on this side or until a instant read thermometer reaches 130 degrees for a medium rare serving. Remove from the pan and place on cutting board to rest for 10 minutes. Place 1 tablespoon of butter on top of the steak and move it around to melt and cover the top of the steak. Prepare and plate your sides. Remove the bone from the meat. Slice the steak against the grain and split between two plates. Sprinkle the top of the steak and sides with your favorite finishing salt. Such as Pink Himalayan Salt. Please note that most of mayonnaise you will not be eating as it will remain in the cast iron skillet once the steak is cooked. 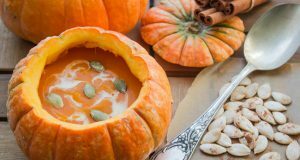 The approximate adjustment will be 135 calories and 15 fat grams LESS per serving. Read through the recipe. Gather your ingredients. Mise en place. A French culinary phrase, which means everything in place. Prep everything first before you begin. 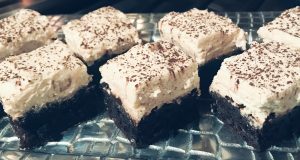 Pingback: What Could Keto Do For You? 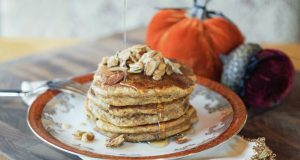 Pingback: Eating Healthy is Expensive - Or is it? Pingback: Are Salads Truly The Healthier Choice?